Juncus (Juncus spp.) grows in wet soil in ponds, streams or near backyard water features. There are more than 200 varieties of juncus, which are typically hardy in U.S. Department of Agriculture plant hardiness zones 4 through 9. Some varieties produce fountains of upright green to pale green grass blades, while others feature spiral or corkscrew leaves. Proper care keeps this perennial wetland plant healthy and attractive. Juncus is also called rush or sedge. Boggy, wet soil, such as the area near a pond margin or in a wet rain garden, provides the best soil conditions for juncus plants. Some varieties, such as soft rush (Juncus effusus), hardy in USDA zones 4 through 9, can tolerate periodic drying out followed by flooding, making them suitable for low-lying drainage beds in the landscape. Provide juncus with full, all-day sunlight. Some varieties, like hard rush (Juncus inflexus), hardy in USDA zones 4 through 9, also tolerate full morning sun and light afternoon shade. Juncus can tolerate any wet soil type that is rich in organic matter. Fertilization isn't usually necessary. Consistent moisture results in the healthiest growth. Most juncus species grow well in moist soils that are periodically flooded or when submerged on the edge of a pond. For pond plants, grow most varieties in water up to 3 inches deep. Some types, like "Curly-Wurly" (Juncus decipiens), hardy in USDA zones 5 through 9, grow in water no more than 1 inch deep. If the plants aren't grown in a submerged area, water regularly so the soil remains damp to a 6-inch depth at all times. Providing 1 to 3 inches of water weekly is usually sufficient, depending on how quickly the soil dries out. 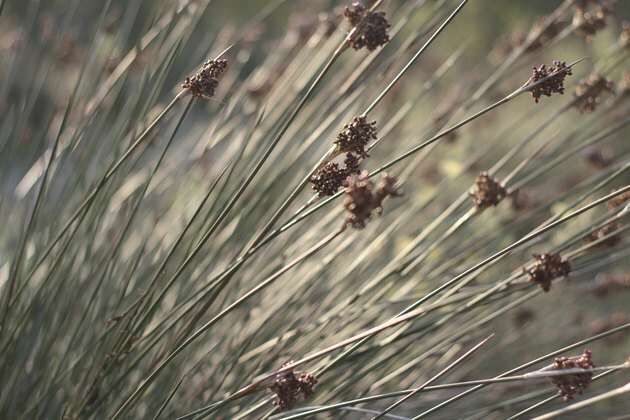 Most juncus varieties set seed in late summer and die back in winter in cooler climates. Trimming off the seed heads when they begin to form prevents the plants from spreading via seed. Cut back the dead foliage to the ground after it yellows and dies back naturally. Cut back the old, ragged foliage of soft rush in early spring in mild climates where old, dead stems accumulate but new growth emerges year around. Before pruning, wipe the pruning shears with a cloth soaked in isopropyl alcohol to prevent the spread of disease organisms. Trim out damaged or dead leaves at any time of year to improve the appearance of the plant. Few diseases or problems affect juncus. Drought stress can cause temporary dieback, while prolonged dry periods will kill the roots. Some varieties of juncus can become invasive if allowed to escape the garden bed, so it's advisable to grow it in containers if invasiveness is a concern. Juncus spreads by underground roots called rhizomes. Planting in a large container or pond basket sunk into the mud prevents the juncus from spreading beyond the desired growing area. Dig the rhizomes out of the container every two years or when the pot becomes crowded. Cut the rhizomes into 2- to 3-inch sections, with each section containing visible buds, using a sharp, disinfected knife. Replant the divided rhizomes with the buds facing up, spacing them 8 to 24 inches apart, depending on the full mature size of the specific variety.